Conveying Awareness with Jessica David: What?! More fish? YES!! From my first post in October, I addressed the common complaint I hear among clients (and friends) is that they want to eat fish but they don't know how to prepare it so I shared a recipe for cod with veggies! Today I'm sharing a quick post on a salmon recipe. Later in the month, I hope to share a collection of fish recipes from real food bloggers. Stay tuned! This recipe is gluten-free but not dairy-free because I used butter and parmesan cheese but you can sub out butter for a vegan (non-GMO spread) and omit the cheese. There is also dairy in the Lundberg Risotto (but it is gluten-free) so opt for a jasmine rice if you're avoiding dairy as well. You'll need 1/2 to 1 stick of butter depending on how much fish and asparagus you have. I used 1/2 stick for the amount of fish in my recipe. Use more or less (to your liking). Risotto (or rice of your choice). I used this brand. Optional: Top cooked asparagus with Parmesan cheese. 2. While oven is warming up, make risotto according to package instructions. 3. Wash asparagus and trim to 1" pieces and discard fibrous ends (or compost!). 4. Prepare butter mixture for fish (and asparagus). A half stick of butter is enough for 6-8 ounces of fish (or 2-3 filets). Mix the garlic, parsley, and optional salt to taste with the butter. If the butter is too soft after mixing, put it in the freezer for a few minutes to let it harden (just a bit) so that it will cook on top of the fish. 5. Salt the fish (just a sprinkle). Then spread a dollop of the butter mixture on top; it should be a thick coating on top of the fish. Add a slice of lemon to each fish filet and cover. 6. In a separate bowl, toss the asparagus with the remaining butter mixture and sprinkle some salt. Cook uncovered. 7. Cook the fish and asparagus for 17-22 minutes. Fish will flake with a fork and asparagus will be al dente. Toss the asparagus half way through. 9. Optional: Sprinkle the finished asparagus with Parmesan cheese. Add a lemon garnish to each fish filet before serving. 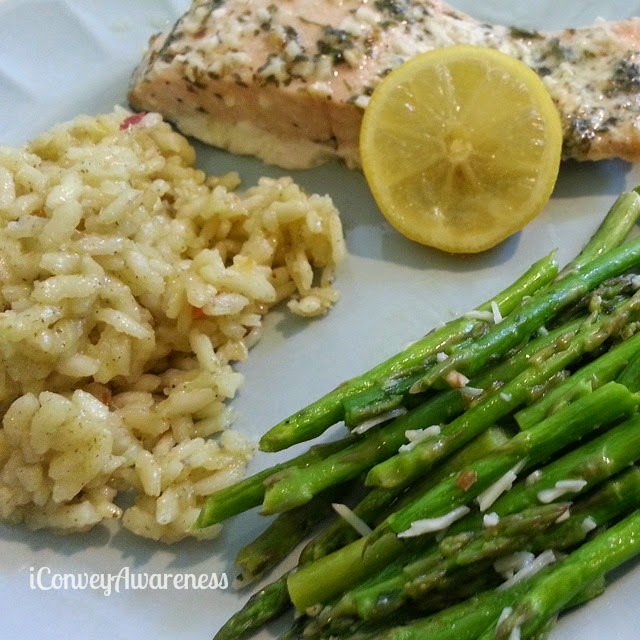 Labels: recipe, salmon asparagus risotto, what?! more fish? Yes!